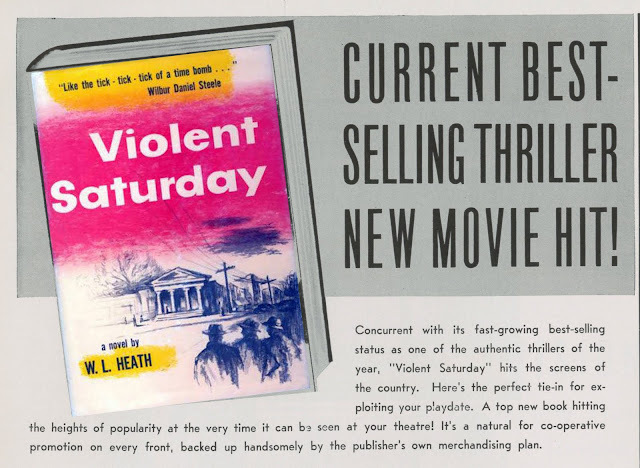 Recent DVD Violent Saturday comes courtesy a label formerly associated with soundtracks. Screen Archives has produced any number of outstanding CD's. Their initial DVD offering was The Kremlin Letter of earlier this year. A deal with Fox enabled that, Violent Saturday, and promised for later The Egyptian. Mixed emotion greets Violent Saturday due to its being released non-anamorphic widescreen, a format long gone to good riddance by collectors. We could wish for its delay till Fox generated a proper master, surely in the offing as their library makes way to streaming and On-Demand. Amazon already has HD Pay-Per-View on many early Cinemascope titles. 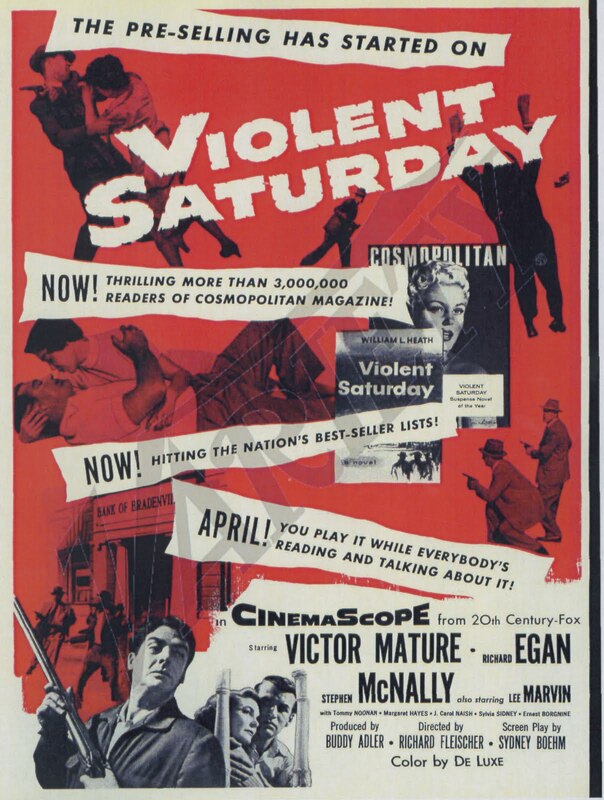 Violent Saturday is too good a show to let languish in obsolete format. 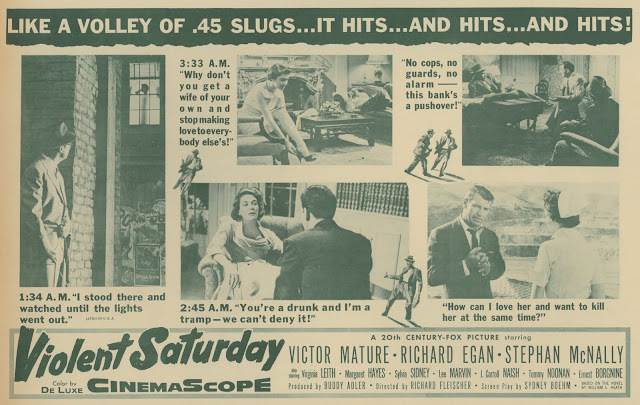 You can stream it today from Amazon at $4 per 24-hour access, but their version is unforgivably full-frame and wretched looking, so for the present at least, we're obliged to take Violent Saturday, imperfect as it is, from what Fox leased to Screen Archives. Question though ... how much more would it have cost to go ahead and do the upgrade? Would a niche following for Violent Saturday have justified such additional expense? Violent Saturday is one you could easily show guests, being short-length (90 minutes) and reasonably quick-tempo'ed to a blistering pay-off that I'd bet still gives customer satisfaction (and has in 35mm revival runs, I understand). 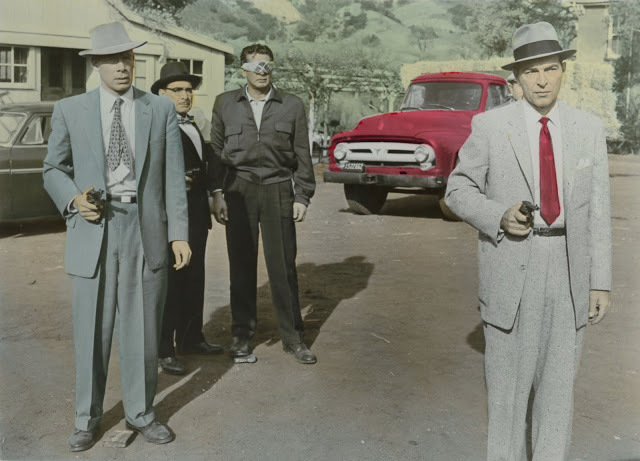 Director Richard Fleischer said in his memoirs that it was Fox's first Cinemascope pic to come in for under a million (negative cost: $958K). 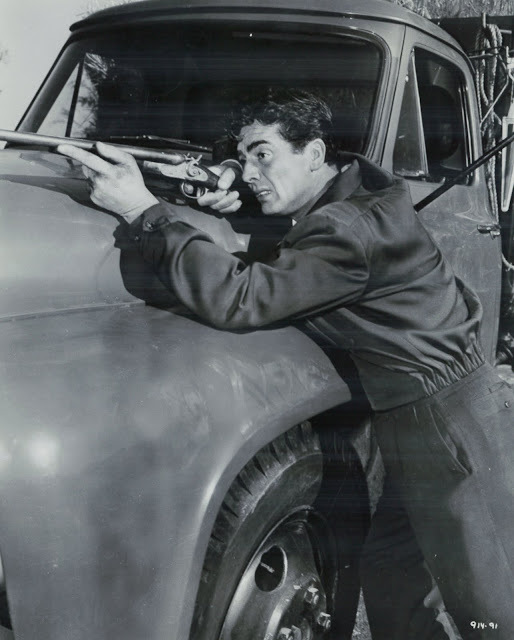 Fleischer had made a reputation with outstanding thrillers done cheap, including Trapped, Armored Car Robbery, and wide-hailed sleeper The Narrow Margin. Most recently he'd finished 20,000 Leagues Under The Sea for Disney, as high a profile release as 1954 yielded. MGM's Dore Schary offered Fleischer Bad Day At Black Rock for an encore, but Walt wouldn't let him off 20,000 finishing touches on Leagues. Part of this director's value to Violent Saturday was Fox's confidence he could deliver their show at economy rate and maintain quality as was case at RKO. Variety observed results and put Violent Saturday in potential sleeper class, but critical/customer breakout wouldn't come this time as it had for Fleischer on The Narrow Margin. Part of dilution was contrived subplots that a trade said got in ways of an otherwise straightforward crime meller after fashion of not-long-before hit The Asphalt Jungle. 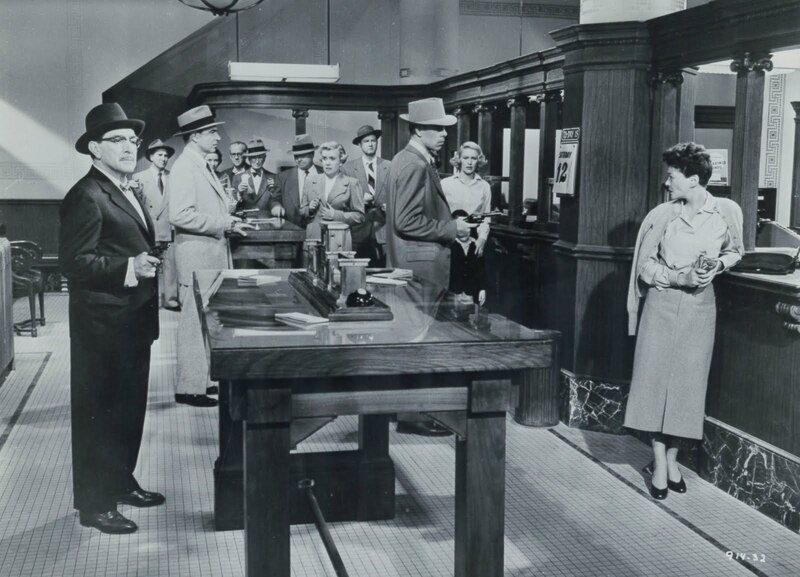 Personal stories linking up and building to a bank holdup were maybe less welcome novelty in 1955 than to modern watchers always game for depictions of 50's family and community life in disarray. 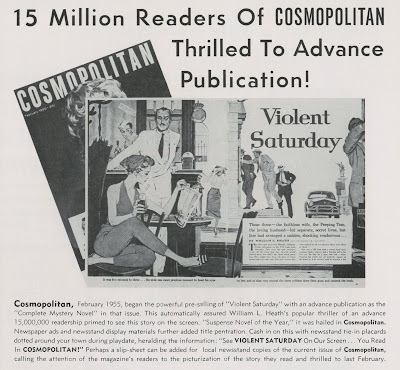 Violent Saturday presents an across-boards frustrated middle-class hip-deep in hypocrisies peculiar, we think, to atomic age dwellers. 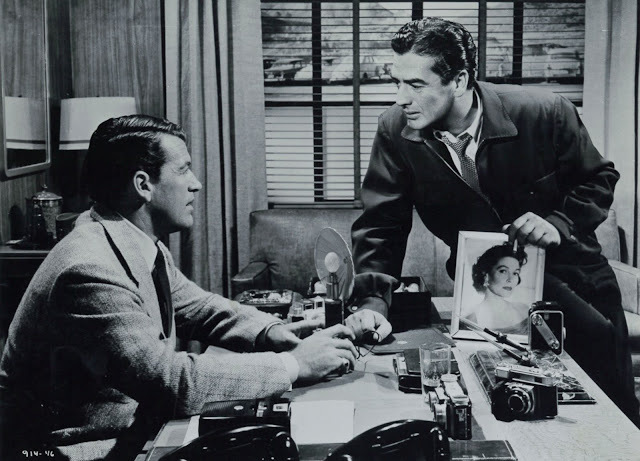 Had Nicholas Ray or Samuel Fuller directed, VS would be all over college syllabi and repeat pressed on Criterion disc. There's cultist catnip yet of Big Heat-ish Lee Marvin grinding a kid's hand beneath his shoe and stops-out violence when Ernie Borginine wields the business end of a pitchfork at the mayhem finish. 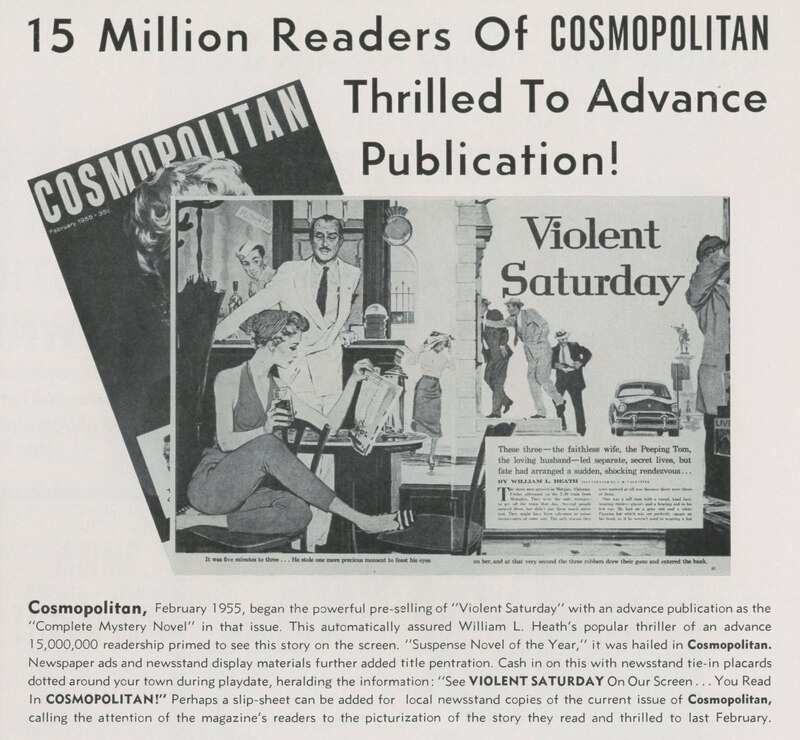 Interest was stoked for April 1955 release by tandem publishing of source novel by William L. Heath (his first) and its appearance in February's Cosmopolitan, said to be inhaled by fifteen million back when waiting rooms and barber shops doubled for libraries. Fox's strategy was to get the story quickest off pages and into theatres while still fresh in reader memories. That worked to tune of $1.3 million in domestic rentals and $1.5 foreign. Profit was $320,000, so it was good Violent Saturday cost no more than it did. 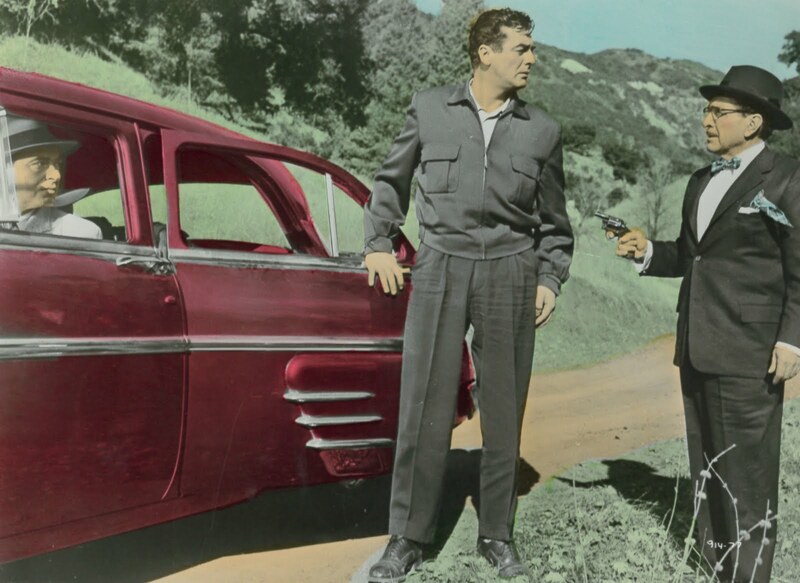 Bloom was coming off the rose for Cinemascope by mid-1955. Grosses dropped as novelty wore off. The process was no longer a crutch for weak content. Untamed, The View From Pompey's Head, and The Virgin Queen each lost money, as did the season's lead "clinker," Prince Of Players, with its loss of $1.5 million. Foreign receipts often exceeded dollars taken by US theatres, even though, according to Variety, there were only 14,000 offshore venues equipped for C'scope as of autumn '55. The Violent Saturday novel was reprinted to joy of 1985 hard-boilers, and those who've read it call Fox's movie unworthy, so maybe it's as well I've not perused Heath's original. Screen Archives' DVD can be ordered from their website. Quality is OK for the compromised format it represents, while hope remains for a better (and anamorphic) release to come. I burned a disc of VIOLENT SATURDAY from FOX MOVIE CHANNEL about five years ago and really liked the film. VIOLENT SATURDAY is a old favorite of mne, partially because the small town used is old Arizona Mining Town called Bisbee, one of the few times it was used for a location shoot. I'm also surprised to hear about it being shown full frame in the digital stream version. My old AMC transfer from a decade or more ago is letter boxed. My wife took me on a road trip through Arizona to celebrate my 50th birthday, and we spent one very fun night stopping at the Shady Dell vintage trailer park in Bisbee, the town where VIOLENT SATURDAY was filmed. It's a great little burg, and we thoroughly enjoyed ourselves. So imagine our delight when VS played at NYC's Film Forum a few weeks later. What a treat to see depicted on the wide screen the town we'd just spent time in, as it was more than fifty years earlier. And you just can't beat Ernest Borgnine portraying an Amish (or AY-mish, as it's pronounced in the picture) farmer. There's something more than a little surreal about that. "Part of dilution was contrived subplots that a trade said got in ways of an otherwise straightforward crime meller...."
The book was built around the intersecting stories, so I was expecting more (book also had a different ending). Eastman House showed a beautiful print a couple years ago--the whole time I kept trying to remember where I knew Virginia Leith from (she'd Jan-in-the-Pan in The Brain that Wouldn't Die), but J. Carrol Naish was the surprise here. He turns is a very nice performance. There is a DVD version in Europe that respects the CinemaScope format. I watched it when I was 10, and was sad that the woman died.I didn't really understand that She was the town floozy, and was probably required to die under the(albeit waning)production code.